In celebration of Amtrak’s 40th anniversary on May 1, America’s Railroadsm is offering several ways the public can join in on the fun, including a special fare promotion, an anniversary website, and a commemorative book and documentary DVD. In addition, the initial schedule of the Exhibit Train is posted online so that those interested can plan a visit to experience this unique travelling display showcasing the railroad’s history. As part of the Amtrak 40th anniversary celebration, children, ages 2 to 15, can ride free of charge for 40 days between May 1 and June 9, when traveling on the same itinerary with an adult who purchased a regular adult rail fare. Families must make reservations in advance between now and May 6, and a minimum of three (3) days prior to travel in order to take advantage of the Kids Ride Free promotion. This offer is valid for sleeping car accommodations upon payment of a full accommodation charge. To make reservations, visit Amtrak.com or call 1-800-USA-RAIL and use the discount code H859. The discount is not valid in conjunction with any other offers. Some blackout dates and seat restrictions may apply. This offer is valid on all Amtrak service except: Acela Express, Downeaster, Capitol Corridor, and Thruway bus series 7000-8999.
dinnerware, and period uniforms. Most locations also will feature train-themed kids’ activities at Chuggington Kids Depot. In addition, commemorative 40th anniversary merchandise will be available for purchase onboard the train. The initial three-month schedule of the Exhibit Train for May through July is as follows. Information about each stop can be found on the official website at Amtrak40th.com where upcoming locations and dates also will be posted. *Chuggington Depot is not available at Washington Union Station or Strasburg Rail Road events. 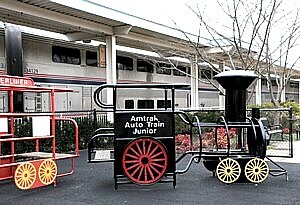 The official website at Amtrak40th.com provides details of the anniversary celebration and tells the Amtrak story by allowing users to explore 40 years of historic photographs and other materials in an extensive and dynamic archive. The site also hosts a blog, provides a link to an online store where a variety of 40th anniversary merchandise can be purchased, and allows individuals to sign up to receive an email alert when the Exhibit Train is coming near their town. The 144-page commemorative book, Amtrak: An American Story, chronicles the history of the railroad with archival photographs, a historical timeline and personal narratives for each decade. Chapter introductions are written by former company leaders and the book contains an employee-generated photo essay of 24-hours in the life of the railroad. The documentary DVD, Amtrak: The First 40 Years, provides an exclusive look inside America’s Railroadsm with hard-to-find photographs and video footage as well as interviews with past and present leaders who have shaped the railroad’s history. A preview of the DVD can be seen here. Both items will be available for purchase online and onboard the Exhibit Train. To mark the 40th anniversary of Amtrak, a commemorative cachet (envelope) was produced featuring an Amtrak train and a silk appliqué of the Amtrak 40th logo. In addition, the envelope bears a special pictorial postmark authorized by the United States Postal Service. This pictorial postmark was created just for this historic event and can be a treasured collectible for years to come. The first sign of the Amtrak 40th anniversary celebration occurred when the first of four P-42 diesel-electric locomotives with one of four historic Amtrak paint schemes entered regular revenue service in January. The four locomotives represent each of the paint schemes that were introduced in 1973, 1975, 1979 and 1993. Each of the historically painted locomotives is now in operation helping to move passengers across the Amtrak national network. Photos of these locomotives are available on the Photos tab on the Amtrak Facebook page at facebook.com/Amtrak. Celebrating 40 years of dedicated service as America’s Railroadsm, Amtrak is the nation’s intercity passenger rail provider and its only high-speed rail operator. A record 28.7 million passengers traveled on Amtrak in FY 2010 on more than 300 daily trains – at speeds up to 150 mph (241 kph) – that connect 46 states, the District of Columbia and three Canadian Provinces. Amtrak operates trains in partnership with 15 states and four commuter rail agencies. Amtrak also is a strong financial performer achieving an 85 percent cost-recovery ratio in FY 2010. Enjoy the journeysm at Amtrak.com or call 800-USA-RAIL for schedules, fares and more information. Join us on facebook.com/Amtrak and follow us at twitter.com/Amtrak.